It seems Nvidia plans to present its ‘Next Generation Mainstream GPU’ later this summer. Videocardz spotted that Nvidia will be holding a session to talk the future of its graphics cards at the Hot Chips conference on August 20th. 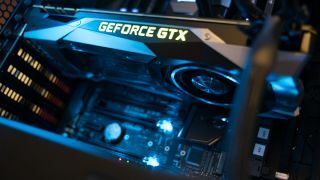 The schedule details that Nvidia's Vice-President of ASIC engineering, Stuart Oberman, will present the company's next-gen GPU technology at the Cupertino, California-based event. Considering ‘mainstream’ is in the name of the keynote, it helps narrow down the subject matter of the presentation to GeForce cards and potentially the rumored Turing family. Ampere and Volta likely won’t be discussed as they’re said to be aimed at the enterprise market and research world. Typically, companies presenting at Hot Chips will go into deep dives on their latest microarchitectures, so we expect Nvidia will deliver the goods at long last – however, just how much Nvidia will reveal is still up in the air. Team Green could potentially just talk about its next-gen architecture, without officially announcing the Nvidia GeForce GTX 1180. Whatever the case is, we’re hoping we’ll finally get some official details on Nvidia Turing and the next GTX graphics cards.